In November, you're going to have the opportunity to order one of the most beautiful limited time product suites I've seen for a long time. Stampin' Up! is offering the gorgeous Snowflake Showcase Suite starting November 1 and only available until November 30 or while supplies last so you'd better start saving your pennies, cause trust me, you're really going want this! My demonstrator preorder just arrived yesterday (one of the main benefits of being a Demonstrator - getting new products early!!) and I just couldn't wait to put a card together with it! 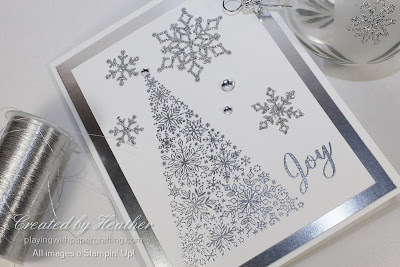 This is one of the two stamp sets that are part of the suite, Snow is Glistening, and it reminds me of the old Snow Swirled stamp set of years ago. I just know it's going to be a top seller! And the coordinating Snowfall Thinlit Dies are going to be Stars in their own right with every size and shape of snowflake that you can imagine plus a gorgeous snow flourish full of snowflakes! But it also coordinates with another stamp set called Happiness Surrounds which is more all occasion and folksy - suitable for all year long! On a base of Thick Whisper White cardstock, I added a layer of Silver Foil and then another layer of Whisper White regular cardstock. I stamped the tree and the sentiment in Versamark ink and heat embossed them with Silver Stampin' emboss powder. 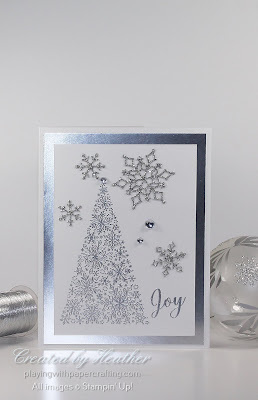 The snowflakes are die cut from Silver Glimmer Paper mounted on Multipurpose Adhesive sheets so that you can just peel & stick them to the project. The final touch is some Frosted & Clear Epoxy Droplets from the Holiday Catalogue which gives some balance to the design. Other parts of the suite include White Velveteen Paper in packs of two 12 x 12 sheets, and some low profile snowflake trinkets. You will definitely be seeing more samples as the month progresses.